The Global Alliance for Clean Cookstoves (Alliance) today announced the appointment of Dymphna van der Lans as its new Chief Executive Officer. 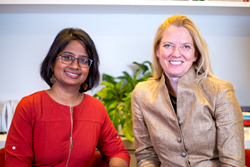 Dymphna succeeds Radha Muthiah, who will continue to serve as a member of the Alliance Leadership Council. “I am excited to join the Alliance, an organization that’s made tremendous progress on one of the toughest challenges of our time,” said Dymphna van der Lans. Dymphna, who will join the Alliance full-time on April 23, has served as the director of global renewables, infrastructure, and energy efficiency at a specialist investment banking firm in London, and also worked for seven years at BP, where her last appointment was as BP Alternative Energy’s director of distributed energy markets. Her native language is Dutch, and in addition, she speaks English and Chinese fluently and has conversation ability in both French and German. Dymphna has worked and lived in China, India and Kenya and worked with island nations in the Caribbean and the Indian and Pacific Oceans to support their transition away from polluting diesel fuels to renewable sources of energy. She holds advanced degrees from both Leiden University and the University of Beijing. In addition, Dymphna earned a Master’s in Business Administration from Rice University and is also a graduate from Dialogos, Leadership for Collective Intelligence, and the Kellogg School of Management’s Sales and Marketing Leadership Program. Since its founding in 2010, the Alliance has raised significant global awareness and engagement around this issue, with more than 1800 active partner organizations, enterprises and governments working on clean cooking. The Alliance has also helped drive the research, standards development, and innovation that are improving both the quality of stoves and fuels available to the consumer, as well as the new business models that are ensuring affordability and distribution to all who are in need. Through joint communications and advocacy, the issue of clean cooking is now firmly entrenched in dozens of country climate plans and within multiple Sustainable Development Goals. The Global Alliance for Clean Cookstoves is a public-private partnership hosted by the UN Foundation to save lives, improve livelihoods, empower women, and protect the environment by creating a thriving global market for clean and efficient household cooking solutions. The Alliance is working with a strong network of public, private and non-profit partners to accelerate the production, deployment, and use of clean and efficient cookstoves and fuels in developing countries.